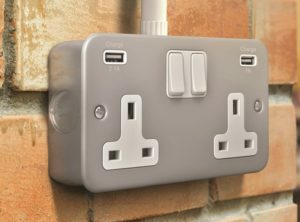 Hamilton Litestat has made its 2.1A/1A dual USB double switched sockets available in its durable Metalclad design finish. With two switched sockets, and combined 3.1A USB charge points, the solution supports the need for increased charging requirements at home or at work, making it even easier to stay connected. Traditionally a heavy-duty range, Metalclad is suitable where hardwearing performance is required, making it suitable for workshops, garages, sheds, schools and industrial premises. And it’s a popular choice for achieving a modern industrial look within a property looking for a sophisticated edge. 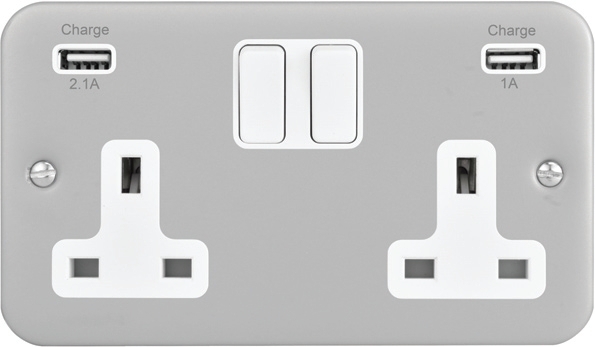 The range comes in a stylish steel finish, with white inserts and white surround. The back boxes have been developed to ensure an exact fit, for that seamless look, and can be surface mounted. And for extra peace of mind, Metalclad comes with a one-year guarantee. Gavin Williams, Hamilton Litestat Marketing Manager, says: “Safety was at the forefront of the design process of the Metalclad range. 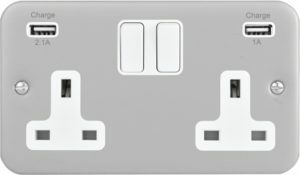 We have incorporated double pole switching as standard, which means that connection to the neutral ‘makes first and breaks last’. Durability was key too.